It’s hard not to get excited about this latest book. Everyone who published, even just an article in a magazine or a paper, and hey, even sometimes just a blog entry, gets a kick out of the chance of being read. Me, not only do I get an opportunity to be read, but this is a chance for people who didn’t get to read my stories when they came out in publications or anthologies to read them as a collection. Adding to that excitement is that the book is out not only in print, but also in digital. I know I’ve been harping on that fact for some time, but it’s something that I was pushing for, and I got it. In a time when my professional career isn’t at its best point, it’s something like this that pulls me up and says, hey you aren’t doing too bad, man. So there’s the book in two formats, which I have here at home. You can get the digital version on Amazon and the print version from UP Press, at their bookstore now, or at National in a couple of weeks. It’s really something to see the two versions side by side. 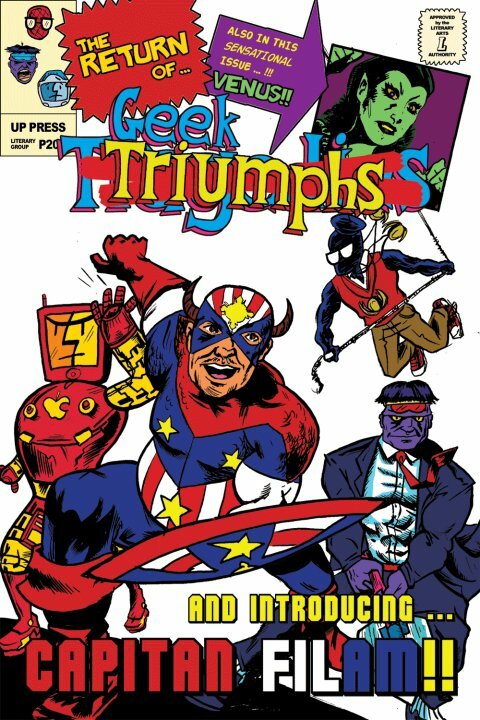 The iPad version is also really fun, the whole thing being formatted in comic fonts, fully-colored and preserving the artwork and coloring by the very awesome Josel Nicolas and Adam David. Adam talks about the design of the book here and here, and I talk about it here. I think that there are so few people reading now anyway that we should provide them with the easiest way to purchase the books, and in the format that they prefer. And I think that this is a step towards that. I also hope that this will prove that digital and print don’t have to compete with each other, but can be used to promote each other. Oh and shirts! There are pics of us with the shirts (some models more attractive than others as Kash Avena and Chingbee Cruz sport the shirts along with Josel, Adam, and me) in Adam’s facebook album here. These are pics from the launch day, when we picked up the shirts, hung out, went to the launch, and hung out some more. Anyways, I’m really happy to have this book out and I’m hoping that you guys can all help to promote it. Please repost, blot, review, whatever. Help me get the word out, let’s get those people all over the world with Amazon accounts interested, and let’s also get our friends to go to the bookstore and give the book a try. It’s a collection that tries to reach out to a more popular audience, and I do think that it can get a lot of people reading and having fun while reading. Hey all, I posted a new essay, “The Talk” about having to give my sister the talk about the birds and the bees, in my scribd feed. Please follow the links to check it out and read it. I’m not sure what book this essay will be for. I kind of was thinking of writing an essay collection about family-life (such as my sister and I have one) but it isn’t clear in my head yet. Still this should be a fun read, discussing sexual awakenings, glow-in-the-dark saviors, and the aches of the adolescent heart. Hope you guys have fun with it. 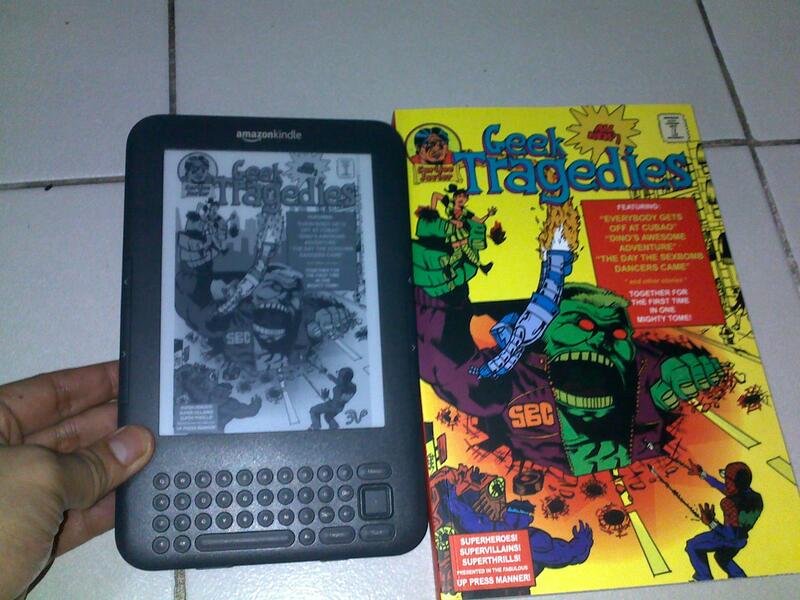 Geek Tragedies now in Print and Digital!